Where can I buy it? Online at Le Kilt. Happy shopping! Who is it? London-based, Scotland-inspired brand Le Kilt – founded by Samantha McCoach in 2014 as a contemporary riff on her family’s own kilt-making heritage – has long been on our radar. And so, doubtless, has it been on yours, for good reason: its semi-regular collections may place McCoach’s Scottish heritage front and centre, but they are founded on a subversive, radical integrity and a love of artisanal craftsmanship. As such, the brand’s evolution has seen the development and extension of its bread and butter offering: beautiful kilts in contrasting tartans and unexpected colour-ways, cashmere knits and tough workwear-inspired pinafore dresses. There have been plenty of collaborations, too, with classic shoemaker George Cox, Sanquhar knits, and Mackintosh, to name a few. Those selected are unfailingly the very best in their game, and are always invited to take part in building upon the existing Le Kilt brand, rather than to wipe the slate clean and begin anew each season. The result? A cohesive collection of key pieces with seasonal additions, which demands to be worn year-in, year-out. Why do I want it? 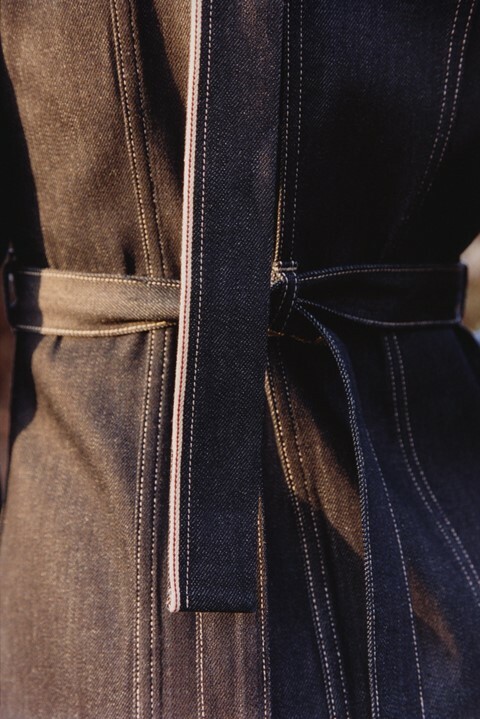 It should come as no surprise, then, that when McCoach decided to turn her hand to denim – “a woman’s wardrobe is not complete without a denim jean” she enthuses – she turned to Blackhorse Lane Ateliers, themselves the ultimate creators of slow denim, in order to do so. The resulting collection of pieces – jeans, dress, jacket, skirt – are adorned with patches of leftover fabrics from the mainline, and slip seamlessly into Le Kilt’s core offering of luxury essentials intended to grow and age as you do. They are raw and unwashed odes to the power of sustainability, community and provenance – and unabashedly stylish with it. If shopping more sustainably – buying less, and buying better – was top of the list of your New Year’s resolutions this week, you couldn’t make a better start. Next up, McCoach hopes to help bring followers of the brand a deeper understanding of what they are buying into when they purchase a Le Kilt piece – from the wool and the buttons to the fastenings and the thread which go into it. “Somebody told me the other day that it takes what an average human would drink in three years in water to make one T-shirt,” says McCoach, “so we should be making more informed decisions about what we buy. When you make a hole, or a repair, or stitch something back on, you’re giving something more to a garment – and if people can see that, maybe we might buy less. I think there’s a responsibility for everybody.” Watch this space. Where can I buy it? Online at Le Kilt.